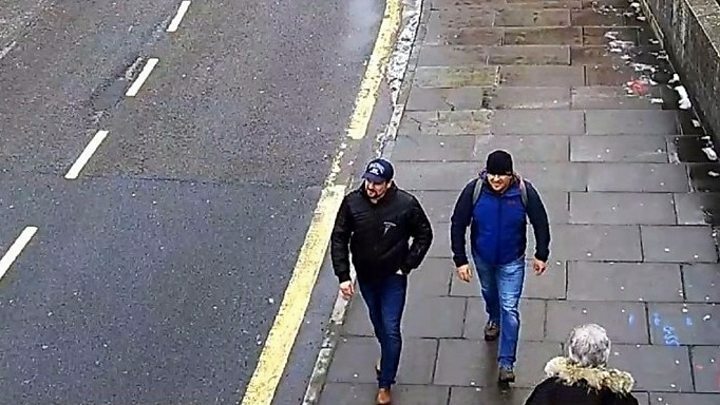 The UK government had named them as Alexander Petrov and Ruslan Boshirov, and said they were from Russia’s military intelligence service, the GRU. Mr Putin said he hoped the men would tell their story soon. Downing Street said that Russia has repeatedly been asked to account for what happened in Salisbury. The prime minister’s official spokesman said that Moscow “had replied with obfuscation and lies”. “I have seen nothing to suggest that has changed,” the spokesman said. Meanwhile, Security Minister Ben Wallace – speaking in the Commons – suggested there had been failures in the baggage checks before the two suspects boarded a plane from Russia to the UK. He added there was “no doubt” there would have been some checks on the Russian side of their journey but “the baggage checks weren’t probably as good as they might be”. Mr Skripal and Yulia were poisoned in Salisbury in the UK in March. “I hope they will turn up themselves and tell everything. This would be best for everyone. Russian state TV says one of the suspects, Mr Petrov, told the channel he might comment publicly on the case next week. Within minutes, Putin’s remarks became top news on Russian TV, which called them “simply sensational”. On state TV’s Channel One, a talk show speculated whether Theresa May would resign upon seeing that Petrov and Boshirov are not Russian hitmen after all, or whether the British government would come up with more “lies” to denigrate Russia. 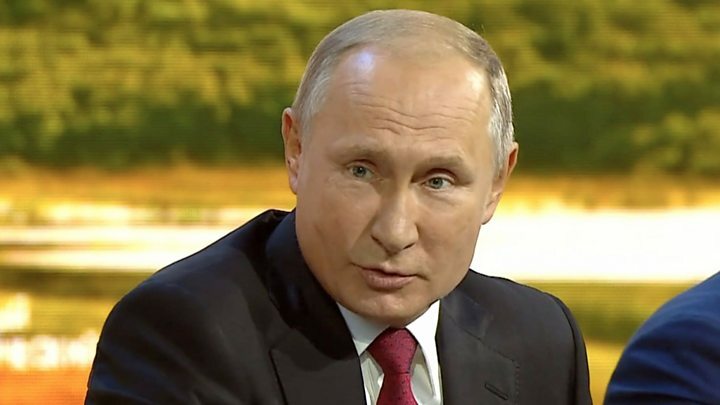 Rossiya 1, another government-run TV channel, showed a beaming commentator saying he was “full of admiration for how Vladimir Putin is doing it”, as the studio erupted in applause. But the Kremlin’s media machine suggested the most exciting news is yet to come – when the two suspects appear on TV in person and deal the final blow to accusations of Russia’s involvement in the poisoning. Det Sgt Nick Bailey also fell ill after responding to the incident in the city of Salisbury. He was later discharged from hospital, as were the Skripals. Police are linking the attack to a separate Novichok poisoning on 30 June, when Dawn Sturgess and Charlie Rowley became unwell at a house in Amesbury, about eight miles away. Last month the US confirmed it was implementing fresh sanctions against Russia over the incident. UK Prime Minister Theresa May has also said Britain will push for the EU to agree new sanctions. In response, Russia accused the British authorities of Russophobia, misleading the international community and UK citizens and of “disgusting anti-Russian hysteria”.